This bag has 3 wheels in the back for easy curb jumping and it makes it very stable even with a joey on the top. The top Bag will lock in with a clip on the back. However I have never had a problem with it staying in place. I purchased this bag for my Grandson last year for Christmas and he has an awful time keeping the top bag in place. Is there some trick to keep it in place? Can you add to this bag to be a six bowler? Hello Ambet! We do not offer any way to convert this bag to a six ball roller. I'm very sorry. Is there enough room to put a Joey on the handle? Yes, there will be enough room to add a Joey on there. Does the handle goes all the way down to the bottom bag. It will go down in flush with the bag. Is the bottom bag able to be shipped on airplane? Handle secured? Is there a pic of it apart anywhere? This bag can break down by taking the top bag off which will help make this easier to pick up for loading in and out of card. However, I would not recommend this bag for airline travel. The handle will not collapse all the way down with the top bag off of the bag. The handle will still be sticking up and this could get caught on something with it being transported and break the handle or platform that the top bag sits on. I would suggest getting one of the 3 ball tote/roller bags if you needed an airline bag because those were designed to meet weight requirements for most airlines. Your warranty begins the date of delivery. There is no need to register for a warranty, we will take care of anything if anything happens to your bag. Unfortunately, we do not sell those directly. You will probably need to contact Storm directly. 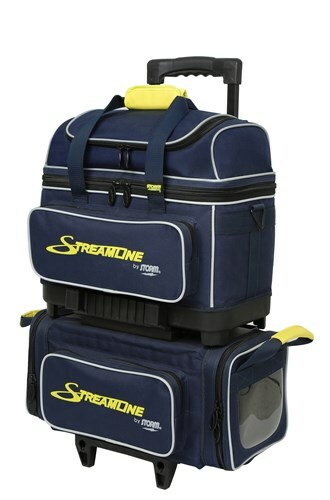 Due to the time it takes to produce the Storm Streamline 4 Ball Roller Navy/Grey/Yellow ball it will ship in immediately. We cannot ship this ball outside the United States.